Using white in your kitchen is a tried and tested décor theme. It instills a bold brightness in your room. White is inviting because it is fresh and alive. It shows that you have nothing to hide and that you want the kitchen to be the focal point of your home. If you’re not sure how to use white in your kitchen, we can help. To make a really bold, bright statement with white in your kitchen, be sure to include natural sources of light. This will make the kitchen feel alive. When natural light bounces off of white cabinets or reflects off white countertops, it can make the room feel larger. Natural light will open up the room and create a space that everyone will gravitate towards. White isn’t simple. You can choose high gloss materials for the kitchen cabinets which will give a very modern feel. You can use a dimpled white instead for a more country feel. Using white in your kitchen could include subway tiles or it could mean using small glass tiles for a backsplash. Your tile floors can be smooth or textured as there is a wide variety of white tiles available. 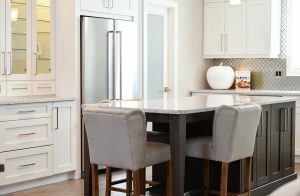 No matter what overall design theme you want to accomplish in your kitchen, there is a white variation out there for you. If you’re afraid of using too much white in a kitchen, then pick one element that will be white. This could be either your kitchen cabinets or your countertop. You can pair white cabinets with a darker countertop for a bold contrast. You can also do the opposite and have dark cabinets with a white countertop. There are many materials for countertops including quartz and marble that can give you a white tone. There are many shades of white and if you’re not convinced about using all white in your kitchen, then it’s ok to add a bit of grey. White and grey pair nicely together. They are often found together in quartz countertops and backsplash tiles. Break up the all-white with some grey to add a bit of depth to your kitchen. If you love a clean, bright look, then take a deep breath and do the whole kitchen white. It might seem overwhelming, but the finished design will be breathtaking. White on white on white creates a bold look that will create an elegant, sophisticated feeling. All white in your kitchen will let guests know that you have nothing to hide. You might have to spend a bit of extra time cleaning, and this may not be the best option if you have small, messy children, but it is a decorating statement worth considering.